Marcel Kittel was over the moon as he claimed his third stage victory in the 104th Tour de France in Nuits-Saint-Georges, the wine growing town after which the St George crater has been named on the moon. It was a very tight bunch sprint finish in Burgundy and photo-finish was necessary to determine that the German has beaten Edvald Boasson Hagen. Chris Froome retained the yellow jersey. 193 riders started stage 7 in Troyes. Maxime Bouet (Fortuneo-Oscaro) attacked from the gun in what would expand to a four-man breakaway when he was joined by Manuele Mori (UAE Team Emirates), Yohann Gène (Direct Energie) and Dylan van Baarle (Cannondale-Drapac). 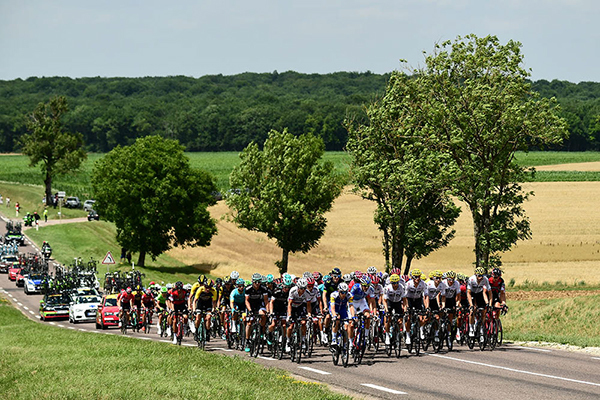 It didn't take a long time for the peloton to get organized with three domestiques setting the pace: Olivier Le Gac (FDJ), Lars Bak (Lotto-Soudal) and Julien Vermote (Quick-Step Floors), at the service of sprinters Arnaud Démare, André Greipel and Marcel Kittel respectively. They were followed by the whole of Team Sky wearing the yellow helmets of the leaders of the teams' classification and protecting race leader Chris Froome. The maximum time gap the break group was allowed was 3:40 by km 30, the escapees quickly understood their chances of success were minimal. 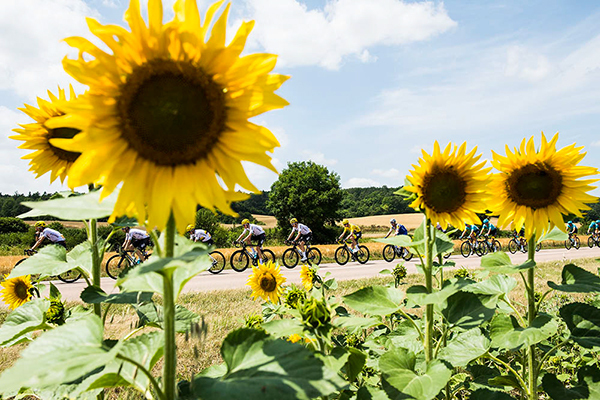 The race situation then remained stable until the race reached the vineyards of Burgundy with 50km to go. 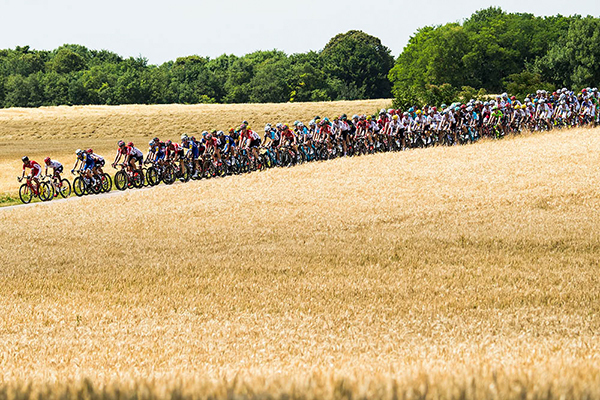 The undulating and curvy terrain, as well as some wind with alternating direction induced the peloton to speed up. Their deficit went below one minute within 40km to go. But they waited for the right moment to catch the four breakaway riders and no attempt to split up the bunch was reported. The leading quartet surrendered with 6km to go. The FDJ team of green jersey holder Arnaud Démare was very visible in the run in but Dimension Data caught the right moment for South African champion Reinardt Janse van Rensburg to lead Edvald Boasson Hagen out. 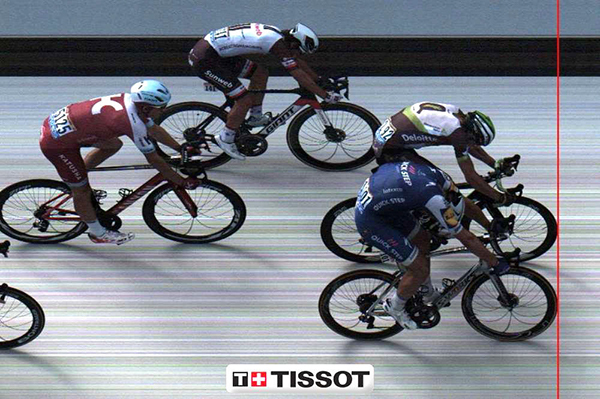 The Norwegian was close to claiming his third Tour de France stage victory after he did so in Lisieux and Pinerolo in 2011 but the photo-finish eventually designated Marcel Kittel who himself didn't know if he had won or not. But it was his third success in this Tour de France and his twelfth one since he first started in 2012. He equals Erik Zabel to become the most successful German stage winner ever at the Grande Boucle. 124 Julien Simon (Fra) Cofidis, Solutions Credits all s.t. 132 Zdenek Stybar (Cze) Quick-Step Floors all s.t. 137 Bernhard Eisel (Aut) Team Dimension Data all s.t. 144 Fabio Felline (Ita) Trek-Segafredo all s.t. 149 Dmitriy Gruzdev (Kaz) Astana Pro Team all s.t. 155 Reto Hollenstein (Sui) Katusha-Alpecin s.t. 159 Davide Cimolai (Ita) FDJ s.t. 164 John Darwin Atapuma (Col) UAE Team Emirates all s.t. 186 Juraj Sagan (Svk) Bora-Hansgrohe all s.t. 189 Thomas Voeckler (Fra) Direct Energie both s.t. 193 Julien Vermote (Bel) Quick-Step Floors s.t. 50 Diego Ulissi (Ita) UAE Team Emirates s.t. 81 Patrick Bevin (NZl) Cannondale-Drapac Professional Cycling Team s.t. 103 Rick Zabel (Ger) Katusha-Alpecin s.t. 117 Fabio Felline (Ita) Trek-Segafredo s.t. 174 Guillaume Van Keirsbulck (Bel) Wanty - Groupe Gobert s.t.